Some notes before we start. This is a series of articles about making the mobile experience better for users, raise discussions and find better solutions together. In early 2007 Steve Jobs announced the very first iPhone. Apple “reinvented the phone” and changed the mobile world as we know it today. Since that moment I became really passioned about the idea that smartphones can change our daily habits, how we find and use information, and how we interact with the world and how we live. We use smartphones daily. Smartphones and mobile devices are made to simplify our lives so we can be more productive and use our time more effectively. But is this always the case? In this article I would like to take a look at a very common problem. It’s a mobile reachability. As an example we will take a closer look at mobile browsers (Safari & Chrome). But the problem exists in many different apps (Mail, Messages etc.) and even in the operating systems (OS) itself. We all came from desktop world. But mobile devices are something different. 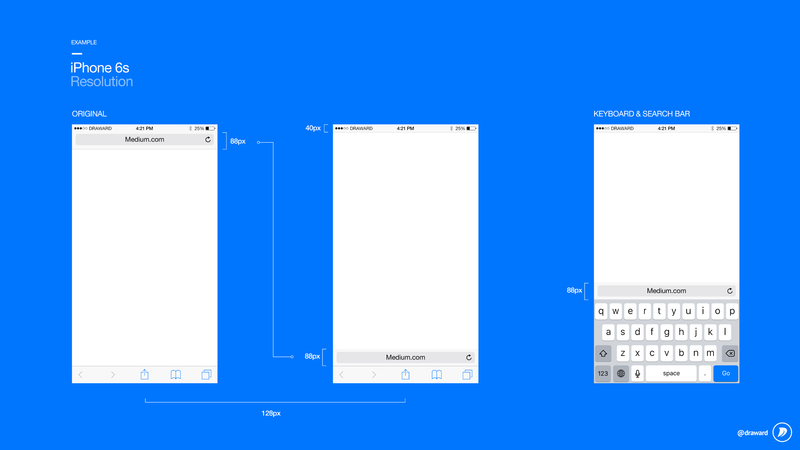 I think it’s a good time for mobile UX, UI designers, developers and people who are connected to mobile devices to start to think differently and separate the desktop from mobile. 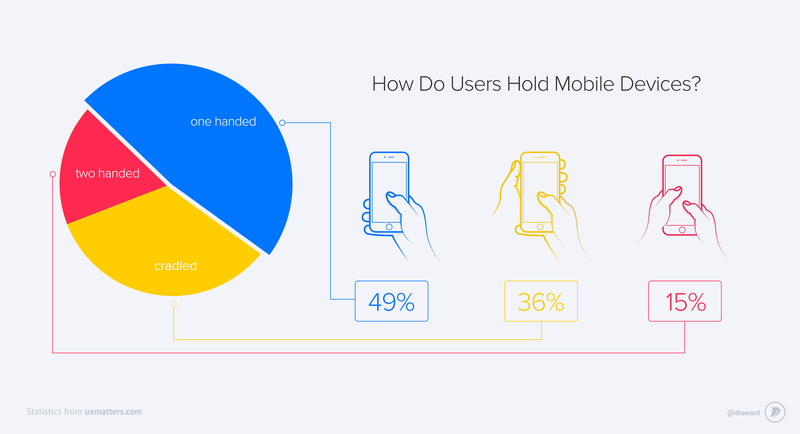 Accordingly to statistics the users hold their phones in three basic ways. Generally speaking most people (including myself) use one hand to control their smartphones. Why should smartphones interrupt or change users habits by making them feel uncomfortable? 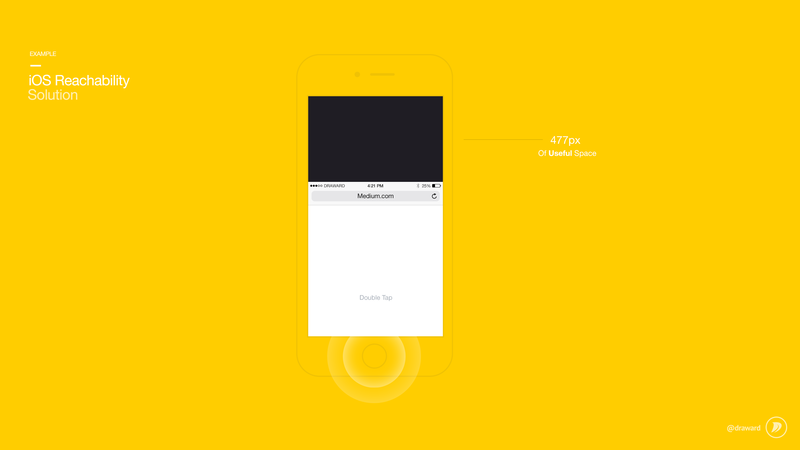 Users shouldn’t have to think about how to hold their devices in any particular moment. This is a big deal, because users don’t want always have to use two hands to do things on smartphone. Mobile devices are always with us. We carry them in situations where circumstances changes really quickly. What if teenager holding ice cream in other hand and browsing the web, businessman editing his to-do list while on the go. The main goal is to provide best user experience without making any additional movements for users that makes them feel uncomfortable. When you are holding your smartphones you have ability to operate only with a thumbs. Human thumbs can’t be stretched to reach middle to top screen areas due to physical limitations. So user experience should be based around this. Software developers should avoid placing any useful buttons, input fields, features in top left or right corners (top area). 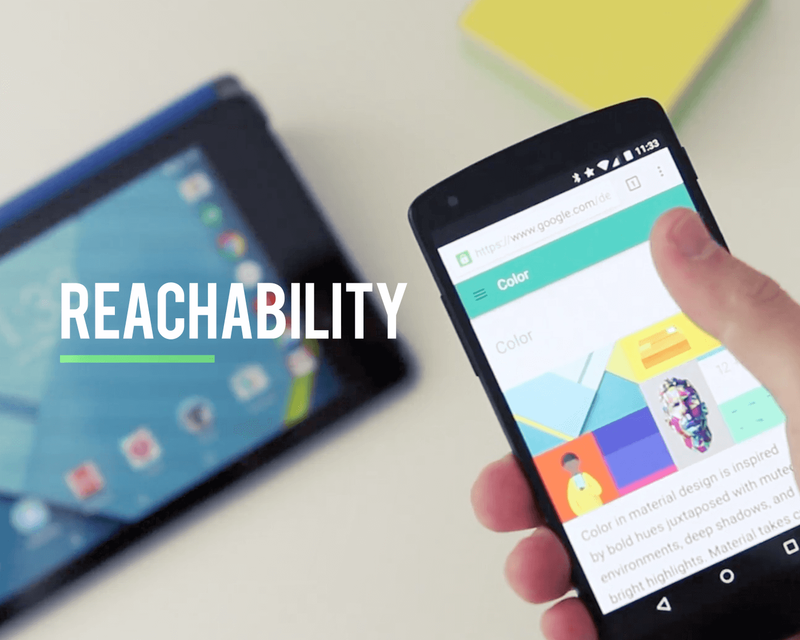 Apple introduced iOS reachability feature back in 2014. Samsung also using similar feature on their Android devices. Old problems might disappear, but new ones arise. Firstly, Apple’s reachability feature suggests to double-tap each time if you want to reach the top of the screen (Example: search bar in Safari). Secondly, design doesn’t make much sense. This iOS feature adds a black rectangle. When I first used this feature I thought it was a glitch. Thirdly, this feature isn’t very logical. Because it always slides up after completing an action. 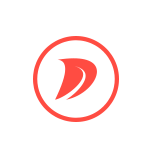 The user therefore is double-taping while working with Mail, Safari or any other app. This is definitely not the solution users want to see. Why we should invent something which is obvious. What if we can simply redesign apps itself without adding unnecessary features (reachability on iOS or similar on other devices). When you design the app you should consider “Rule of Thumb”. I strongly believe that reachability (iOS or similar) features can be avoided by software developers and designers if they will consider this rule. Sometimes it may require rethinking the whole user experience of their apps. Keep existing user interface design (Guidelines). My goal here was to keep the beautiful design of Safari without avoiding existing Apple iOS guidelines and make the app more user friendly. 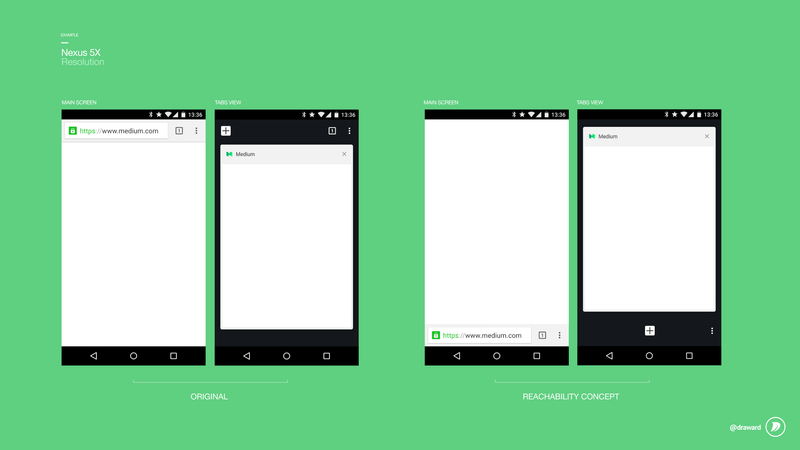 By keeping same sizes we have made huge improvements for user experience. Now users can easily reach all necessary features and can use it faster and be more productive by holding smartphone in one hand. Chrome team did a great job by simplifying user experience and making chrome browser simple and clean. But absolutely forgot about reachability and “Rule of Thumb” which makes impossible to reach most used search field and buttons without changing hand positions. And as expected “+” in tab mode was placed far away. As like with Safari my goal here was absolutely the same. To show ability how without changing existing design and by making simple UI modifications we can get absolutely huge improvements and different result from the user perspective. In this article I have tried to pay attention to one problem. This is one of many problems we are facing today on our mobile devices. But it’s only beginning, because smartphones will stay with us for a long time. Our user experience journey of failures and success began 7 years ago. It’s now time to make the necessary changes to avoid problems in future.